I have redeemed myself. The men in my house suffer from severe bagel addiction. So, I've wanted to try my hand at them for years. After screwing up the bread, I figured I had nowhere to go but up. Let me just say, I can make a bagel, baby. 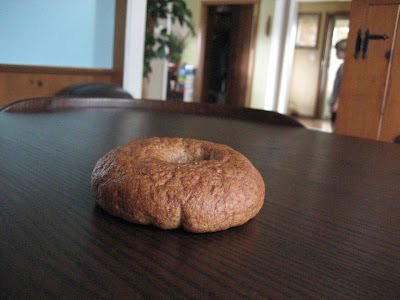 "Can you believe our Mom cleaned the kitchen table just to take a picture of a bagel for her blog?" Labels: stop cooking crap, who ARE all these kids? And what a gorgeous bagel it is! yum! but really was going through my mind was..."man, how in the world does she keep her house/table so clean".. then I read on...weew!!! I'm gald to know I'm not the only one to clear things away just to take a picture! ..we'll got go..2 yr old is eating dog food.. and she alreay ate lunch!! I totally need to try my hand at bagels. I am such a chicken when it comes to such things - shocker, I know... but bagels have intimidated me far too long.